Sending sunshine and sparkly blessings to Anne at Artisanne-Scotland and MysticWynd for awarding my blog with the Sunshine Blogger's Award. It really means a lot to hear from you, my dear readers and especially when you comment - it makes me feel less alone out here in the hinterbloglands of virtual reality and you can trust that I'll be doing my best to "Pay It Forward" and respond to all of your comments when I get the chance. The Sunshine Award is awarded to bloggers whose positivity and creativity inspires others in the blog world. 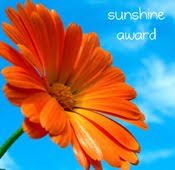 The rules for accepting the Sunshine Award are: 1. put the logo on your blog or within your post. 2. pass the award on to 12 bloggers linking to the nominees within your post. 3. let the nominees know they have received this award by commenting on their blog. 4. share the love and link to the person from whom you received this award. Thank you to all bloggers everywhere who are doing a good job, and carrying on with heart, passion and intelligence above all, to enlighten our hearts, minds and souls often without pay or appreciation, so keep the comments flowing and let's keep our blogger's world alive, kicking and changing the world into the kind of place we want to live in and pass on to the coming generations.